Two years ago my 1960's nativity set was destroyed in our storage space. Of all the things we lost during a terrible rat infestation, this was really the only thing I grieved over. I found it at a thrift store the first year we were married for three dollars. It was simply Jesus, Joseph, and Mary, and it was perfect. Now it's long gone and I'm hoping to find something to replace it. I could go either way with nativity sets - I love vintage and I love modern. 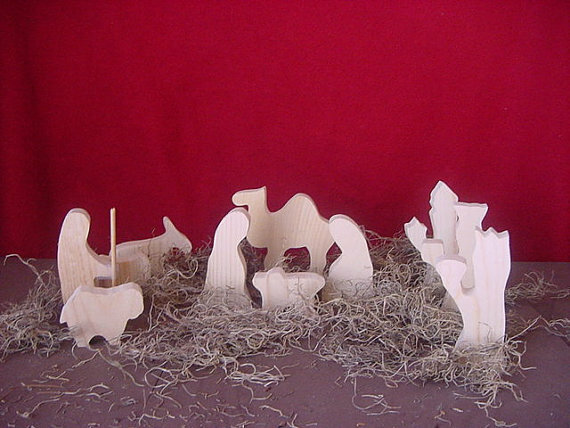 But most stores no longer sell nativity scenes and many I found online were in the $200 range! Thank goodness for Etsy! Here are a few favourites I've found. 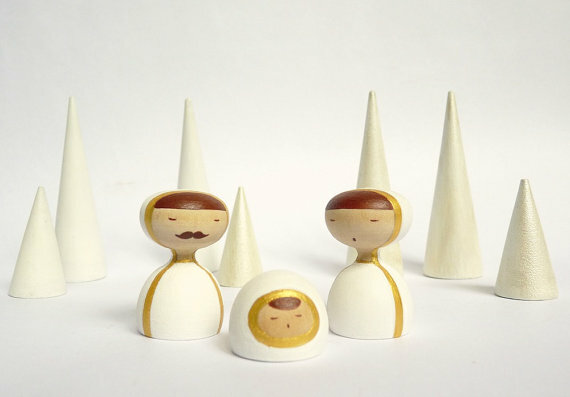 I love the modern wooden peg doll sets! This one is on the pricier side, but I think I'd be willing to invest in a nativity set in hopes that it would be central to our traditions every year. Here's another one that's a bit less but almost identical. We don't even have a tree and spent $5 on some pine branches this year, so maybe! I really love this earthenware clay set. It's minimal, affordable, and you can choose the colour of glaze. I'd probably go with a soft green/mint. 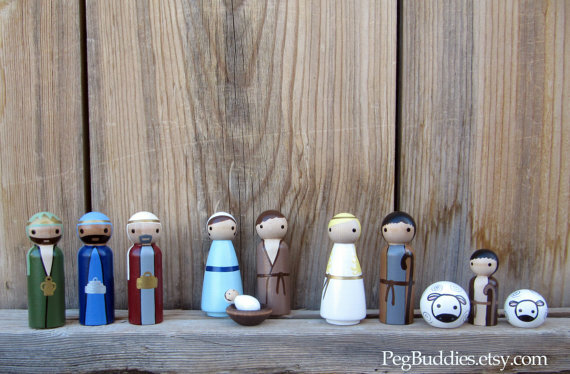 I love this modern and simple set with just Jesus, Mary, and Joseph. Love the all-white and touches of gold. So dreamy! I love this set for it's simplicity and price! $7! Unreal. I love the natural wood and that's it's a small set. There's also a slightly larger set by the same maker for $13. 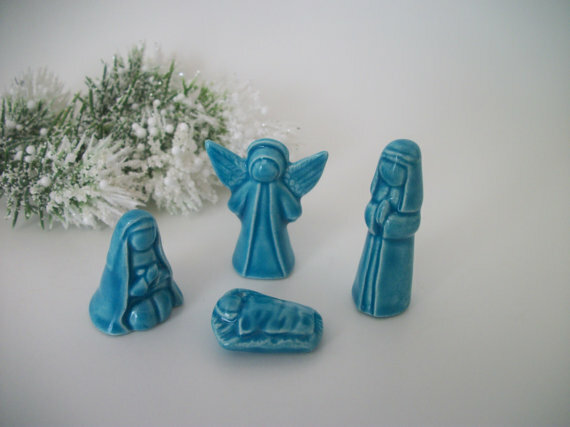 This one is vintage from the 1960s and reminds me of why I loved my old nativity set! Although this one is even better because mine was all Caucasian, aka not accurate at all, ha! I see nativity scenes as the type of decoration that stays in a family for a really long time, generations, even. Maybe menorahs are the same for Jewish families? Either way, I can't wait to get this tradition re-established in our home. Which one is your favourite? Check out Ten Thousand Villages. They have sets that have been made in different countries and so there is so much diversity in how the people and the scene is depicted. They are pretty incredible! thanks for the tip Julie! Just after we were married 8 years ago, we purchased our beloved nativity scene from Ten Thousand Villages. I'll instagram a photo later today. From your choices, I do love the top one though, I've been checking them out for a few years! I can't wait to see yours Amie! I collect nativity sets and Penny plays with them all December. It's really helped to focus on the spirit of Christmas. We also saw a live nativity scene which was really fun and the kids really enjoyed it. Penny really felt like it was "the real thing". I think in her mind we were time travelling lol!